This RCA DVD player has a 7-inch LCD screen. 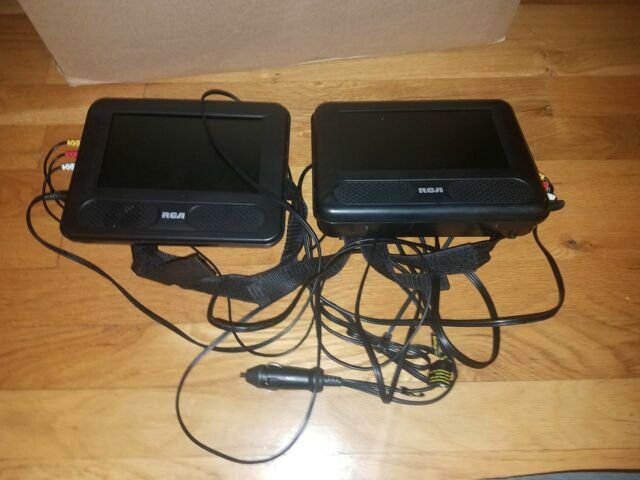 The RCA DRC69707E also has an additional 7-inch LCD screen for dual-screen viewing. This portable DVD player can also be used as a monitor for game systems. This device comes equipped with built-in speakers and dual headphone jacks. This RCA DVD player comes complete with a remote control, an A/V input, and output jacks. Features of the RCA DRC69707E include electronic skip protection. This device is completely portable and can be taken anywhere, even to the beach. This portable DVD player is also equipped with two headrest-mounting kits for ease of use in a vehicle. An AV power cable is also included with this unit, and is integrated into the LCD screen unit. This RCA DVD player plays DVDs, CDs, as well as JPEG files. This unit also includes a dual output car adapter and can be hooked up to a camcorder. The weight of this device is 3.6 lbs, and its dimensions are 6.5 inches tall by 8.3 inches wide by 2 inches deep. Great item that keeps the kids occupied! Great Item, Great for trips, only challenge is you have to drop the screen on the main one to change the DVD, but that is ok. It works great and the kids love it.